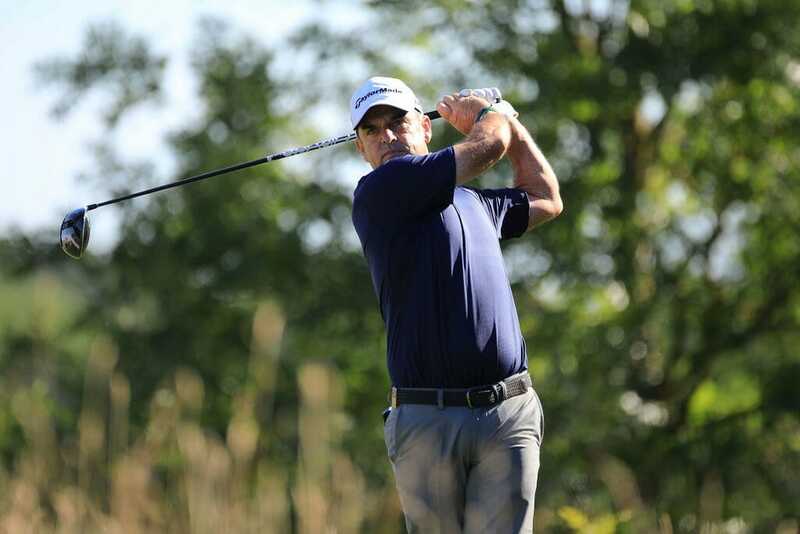 Paul McGinley continued to roll back the years with a fine opening round 68 at the Staysure PGA Seniors Championship at London Golf Club. After showing glimpses of former glories last week at the Senior Open, the Dubliner looked good again on British soil and fired six birdies and just the two dropped shots to share in a tie for 15th spot on four-under-par. That sets the standard in terms of the Irish challenge but three names synonymous with our island’s accomplishments in the sport all enjoyed solid opening efforts too. The trio of Eamonn Darcy, Des Smyth and Ronan Rafferty all signed for even par 72s and sit in mid-division in a share of 43rdspot heading into day two. Unfortunately the day wasn’t so good for Headfort’s colourful professional, Brendan McGovern who opened with a plus two 74 while former Ryder Cup hero, Phillip Walton took one shot more in his 75 to start. Everyone’s favourite Scot, no not William Wallace, yes, Colin Montgomerie leads the Championship at the end of day one after he carded a course-record eight-under-par round of 63 in London. The three-time Senior Major winner, playing alongside McGinley, holed nine birdies without a dropped shot as he recorded his lowest round since he joined the Staysure Tour to lead the Championship by one shot ahead of the 2017 John Jacobs Trophy winner Clark Dennis. The Scot started strong with a birdie on the first before further gains on the fifth and eighth holes, as well as an important par save on the ninth. The victorious 2010 Ryder Cup Captain kicked on immediately after the turn with four successive birdies to take the outright lead. Two birdies on two of his final three holes extended his advantage as he goes in search of the history books. Montgomerie could become the second player in history to win the PGA Seniors Championship and the Seniors PGA Championship alongside the late Peter Thomson. With lush fairways and sun-kissed greens, a low score was achievable for Montgomerie as he looks for his second Staysure Tour title of the season after success at the Shipco Masters promoted by Simon’s Golf Club in June. “It was a very good round – no bogeys, nine birdies,” he said. “I always enjoy playing with Paul McGinley and I usually play quite well with him. There was a good rhythm and we played well together. “The course was set up lovely and the conditions were super. We were out early, the greens were good, and there wasn’t any wind. There were opportunities to score today. American Dennis finished late in the afternoon but finished in style as he carded a seven under par back nine to add to his one under par front nine. The recent Senior Italian Open presented by Villaverde Resort champion carded four consecutive birdies after the turn before he ended birdie-eagle to jump up to second. Peter Baker and Jarmo Sandelin also came in strong as they shot rounds of 65, seven-under-par, to sit two strokes behind Montgomerie as part of the chasing pack.